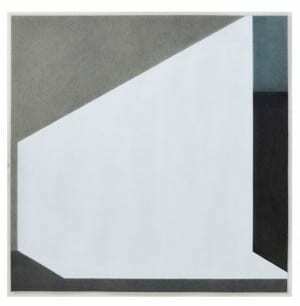 Pete Schulte makes geometric works on paper that vibrate with a lifelike pulse. His current solo exhibition Build a Fire, on view at Whitespace through March 28, is mathematical in its concision. 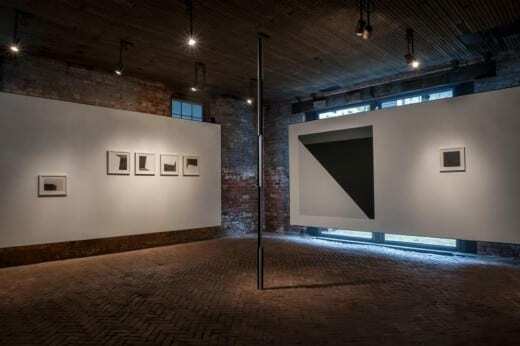 The suite of abstract minimalist drawings, sculptures and wall paintings mirror the architectural nuance of the gallery, accentuating the broader geometry in which the works reside. The result is an overall feeling of cosmic precision — like fung shui articulated in actual coordinates, edges and interstices — that yields a dark tide upon closer inspection. To say that Schulte is a perfectionist isn’t exactly correct. Or rather, it’s not the point. His work presents him as more of a Zen draughtsman, reducing his visual world to the barest essentials for the fullest possible effect. He is able to say a lot with very little, employing a mode of reductionism that searches for whatever is elemental, essential and pure. Such traditional minimalist aesthetics, as they’ve evolved since Minimalist art began in the 1960s, might otherwise convey a kind of analytic sterility, operating in the service of pure form, as opposed to human narrative or emotion. At best, geometric abstraction can actually feel transcendent or sublime through seemingly divine geometric harmonies, as if revealing some secret order to the universe. Schulte has a keen eye — call it a superpower — for such perfect harmonies. He makes use of these more resonant minimalist strategies and intermingles them with inferences to the human form, cultivating a ghostly lifelike presence in his works. This quality comes across most profoundly in Schulte’s drawings, particularly in his use of densely layered graphite as his primary medium. Graphite, a naturally occurring carbon-based material, not only seduces with lustrous tactility, it actually feels alive as it sits on the surface of Schulte’s drawings. Like putting one’s hands in the earth and touching soil that feels organically alive, Schulte’s particular use of graphite pulsates with living activity. This unexpected presence is what deepens Schulte’s work. Otherwise simple geometric forms feel submerged in dark pools of sentience and awareness. The effect can be startling. This use of black appears in most of Schulte’s drawings, and is arguably the strength of the work. It has its own gravitational pull, luring you into its suction like a heavy undertow. Painter Mark Rothko’s Black Paintings, famously made for the interfaith chapel in Houston just before the artist’s suicide, operate similarly. Such works have a simultaneous reflective and absorbent quality, functioning as both a mirror to the self while endlessly projecting into a terrible dark void. 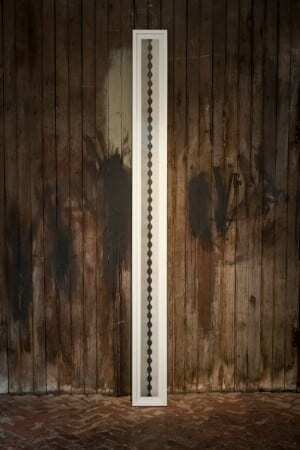 Schulte employs optical illusion and other visual strategies as added content in his work. Many of his drawings operate from multiple perspectival orientations. Such multiplicity of perspectives can feel disorienting, which further contributes to the show’s ebb of mystery. But it’s also a game of sorts. Sounds like Someone Else’s Song re-creates the angular formations of the actual wall on which the piece is hung, giving it a feeling of punctuation in the specificity of its placement, while also a playful riddle. No Exit, a series of four simple drawings, conveys interior spaces that collapse into flat, tactile surfaces upon closer look, similar to local artist Katherine Taylor’s small painterly landscapes that reduce to mere brushstrokes when viewed up close. Other works such as French Film Blurred and The Wall feel more narrative, their abstract elements mimicking the compositional format of traditional figurative landscapes. Schulte’s figures — most often a circle or a line — have their own auratic presence and are often situated as lonely characters upon an empty horizon line. As a viewer, it is natural to empathize with these figures, which translate as human surrogates. In other works such as Clipped and Distant what would otherwise appear as a figurative landscape instead reads as an empty stage, filled by the presence of the viewer. It’s hard to say how much of Build a Fire‘s supposed dark tide is inherent and how much is informed by the sound work A Letter Edged in Black that permeates the exhibition space. Ominous, eerie and at times a tad oppressive, the piece, which was composed for a previous exhibition, sounds like the sort of thing played in experimental films before something really bad happens. It’s hard not to view the work through this auditory influence. Without the sound, one wonders if the same show would otherwise appear as a collection of purely formalist works. The sound piece is an effective device, however, in that it threads the entire show together thematically, and in ways that elevate certain works that may not stand alone on their own. For example, Schulte’s sculptural pieces read as afterthoughts, the first round of an attempt to make three-dimensional versions of his works on paper. The choice of surface material — shiny black enamel as opposed to the lustrously organic graphite — give the works a shallower effect. 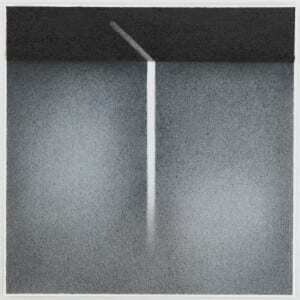 Broken Line Drawing, for example, is a tallish, vertical sculpture made of aluminum, and is just that — a broken line in space. In relationship to the rest of the show, which seems themed on the subject of humans inhabiting space, this sculpture, no doubt, makes references to humankind’s verticality as walking the endless horizontality of the earth. It is what Jean-Paul Sartre called Alberto Giacometti’s desperate need to remedy the “desolate sterility” of empty space, when describing the artist’s obsessively sculpted sinewy figures. It is a way of marking human vitality and selfhood within the staggering infinity of time and space. But if this work were isolated from the context of the show, what would remain? A more successful version of this sculpture is The Braid, a thin, roughly seven-foot-tall drawing of what looks like braided hair or, more potently, a very long spinal cord standing upright in the gallery. Infused with the same potency of Schulte’s use of densely layered graphite, the drawing emanates the aura of living, breathing things. Because of its close proximity, the drawing’s uncanny charge elevates Broken Line Drawing. As a total experience, Build a Fire is a solidly conceived exhibition. Schulte has clearly thought of everything, and it shows. Humanizing the languages of geometric abstraction, Schulte proves that art history can be resurrected, reinvented and seen anew without being derivative or rote.